Do you sing, play an instrument, or enjoy technology? If so, we can put your talents to work! If you would like to discuss being a part of any of these, please let the staff know how you would like to serve. We have a wonderfully gifted Sanctuary Choir which rehearses on Wednesdays and sings in our worship service each week. And we offer several other venues where creative worshippers can serve. Those in our worship ministry frequently participate in bringing music to the community and serving on various ministry teams. We love our church and the music we sing, play and live. It spills over into all we do. Our response to Jesus’ great love for us is worship and giving that love away however God leads us! FIRST FAMILY SINGERS • This lively group of singers age 55+ meets on Wednesday afternoons at 4:00 p.m. in the choir room. 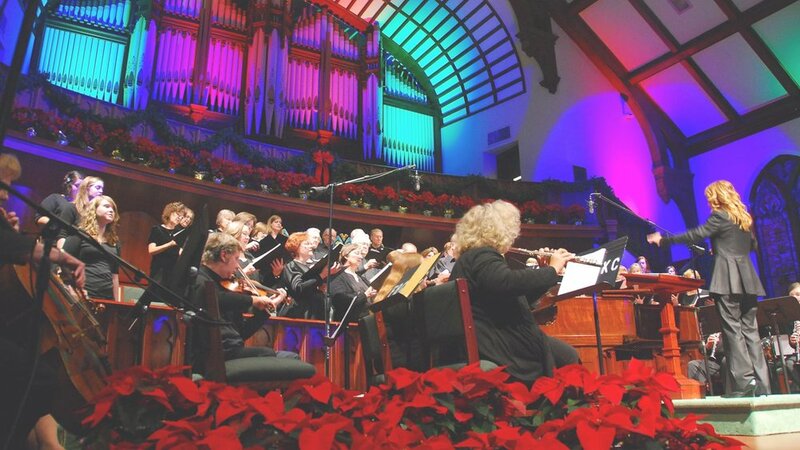 This choir shares its music at events inside and outside the church all through the year. MEDIA TEAM • We are always on the lookout for volunteers who have skills and interest in serving in our sound booth for our worship services and special events. INSTRUMENTALISTS • We love variety at FBCOKC and use many different sounds and instruments in our worship services as well as other musical venues. Whether you play violin, guitar, drums, flute, piano, trumpet or most anything in between, we have a place for you.